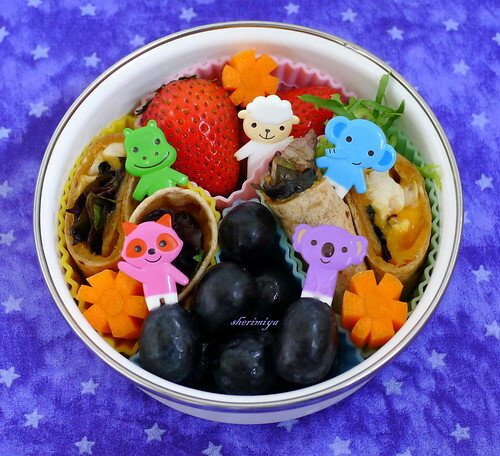 Round Wraps Friends Bento, a photo by sherimiya ♥ on Flickr. A cute little bento for TinySprite in the round enamelware bowl with transparent lid I got from Daiso. It also comes in a square shape, and as nesting sets as well. These are a nice alternative to the stainless steel side boxes I usually use, and I like the clean white effect. Here I used four colorful silicone cups to keep things separate: chicken-lettuce-cheddar wraps in whole wheat tortillas, carrots, strawberries and grapes. I also tossed a couple of corndog minimuffins in her bento bag for snacktime. I made a batch of these cuties for MisterMan to take to school for his Valentine party (I found the recipe here), but of course I had to use chicken-apple sausages instead of hot dogs. They taste pretty good, if not exactly like corndogs. Fun idea though! Hope you all had a fun and enjoyable Valentines' Day with your loved ones. XO to you! Very adorable with those cute picks,LOVE it! Thank you Rina! These picks are from Ichiban Kan; they are the cutest ever. Thank you for the kind words Rini! The clean white effect was what I first noticed. That and the abundance of cute picks :o) Lovely. Yes, don't the two elements go well together? I wonder if the white enamel will stain... but never mind since it won't happen today. I'll find out someday. 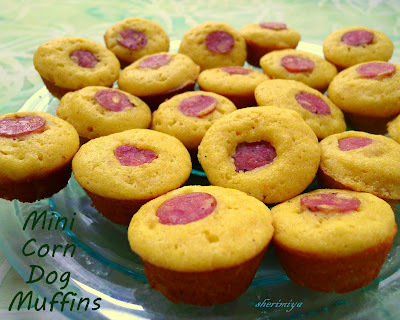 I love the mini corndog muffins! They look so tasty! Oh hello little friends! How are you today? :) I love all of those little guys, they're precious. Those corndog muffins sound fantastic... I wonder how they'd be with some spicy chorizo? Mmmmmmm! Oh man, you know they'd rock the chorizo! You better make 'em like that girl! Round and round, pretty and cute! Have to love this Zen form full of friends and delicious food! Hope you had a sweet Valentine´s Day too! Big sweet (coconut) smooches to you ;). Zen friends and food can never miss! Sweet corn is a good thing, I agree. Enough butter and the girls are sure to gobble them up I think! xoxs back to you! Thanks L! These are so cute, Sheri! ^^ These muffins kind of remind me of those wiener buns from the Chinese bake shop. Thanks AikoVenus! Yes, they do resemble those. What a great combo, I think! Such cheerful picks, smiling perfection in this darling and tres tasty bento. Muffins have my tummy growling!